« Doesn’t Feel Like Fall! Looks like we might get some rain starting tonight. Some might be severe with the rain continuing into tomorrow morning. Temperatures are going to take a dive into the upper 50s or low 60s for a high tomorrow. Back to sunshine late tomorrow. Monday through the rest of the week looks pretty good with temperatures in the 60s and 70s for highs. By next weekend, we are seeing 50s again and a chance for rain on Saturday. Otherwise, the following week looks great with lots of sunshine and mid 60s for highs. Water has been up and down this past week. Mostly down, especially in the morning and early afternoon. Then up for 1 to 3 hours and back off again. Well, just like the water, fishing has been up and down. 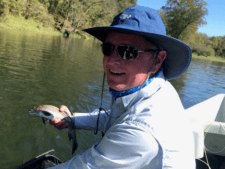 Some days really tough and other days good fishing….especially for this time of the year. Seeing and hearing of a few really nice browns being caught, especially up around the outlets. Now, let’s get caught up again. Last Wednesday, Jim was on the river with Gina. Fun day, not lots of fish, but enough to keep one happy and interested. Best pattern was the ruby 2 under and indicator. Catch of the day was on a Fat Albert with a midge dropper. Dana was on the water with Eric and Hope from Forsyth. They are new fly fishers and wanted to learn a little more about fly fishing. Had some hits, lost a few fish, and caught a few on the lightning bug. Friday the 13th, Stan took John and Tiffany from Texas out for half a day. Bite was slow again and he decided to go to 7X and they did catch some fish on the ruby 2 midge after this change. Easy on that hook set! Mike and Jan spent half a day with Carolyn. We found some fish, mainly in one place below the boat ramp, and stayed with it until time to come off the water. Jan was catching on the ruby 2 midge in shallow water against the bank. 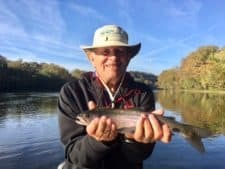 Mike caught several on the holographic green crackleback stripping it cross current in the fast water at the narrows. Saturday was a little better. Stan had Glen and Monica from Texas out on the water. They caught fish on the P&P. However, they was a period when nothing was hitting anywhere. Jerry and Kenny from Kansas spent all day on the water with Dana. Best pattern for them was the P&P with a blood worm dropper. her birthday was much earlier this year. It was actually George’s birthday the next day if I remember correctly. 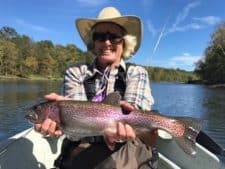 Anyway, it was Wilma’s day and she caught a beautiful 18 inch rainbow among her many others. Good day on the black copperhead midge early then the P&P. Both are fairly new fly fishers, so we mixed things up a bit. We even caught a fish or two stripping the holographic green crackleback. This was George’s favorite way to fish. Good day for Donald and Patricia who fished with Stan Monday. It was ruby 2 early then the P&P. Brad and Terry fished with Dana on Tuesday. Another tough day, but they caught fish on the dark olive soft hackle or the P&P midge with the size 22 blood worm dropper. 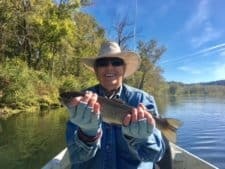 a trout, bluegill, shad and even landed one rock! had a good half day on the P&P and ruby 2. Again, what a difference a day makes. 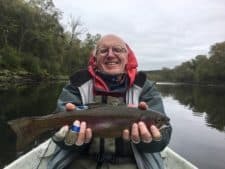 Friday, Gary and Bob were again fishing with Stan and Carolyn had Bob’s son, Darrin, and grandson, Colby out for half a day. Tough! Can’t say there was any good fly. We caught a few fish, but it was here and there not very many on any one pattern. Dana had Dan from St. Peters out and they caught fish on the pumpkin crackleback, ruby 2 and P&P midges. Sunday fishing was still pretty tough. Dwan and Robert fished with Stan and caught mainly on the ruby 2. 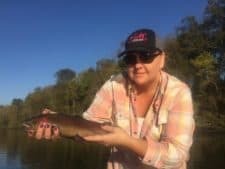 Dana took a fairly new fly fishing lady, Melissa,out for the morning. She had fun catching on the black copperhead midge. 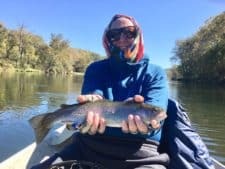 This entry was posted on Sunday, October 22nd, 2017 at 11:45 am	and is filed under Fishing Reports. You can follow any responses to this entry through the RSS 2.0 feed. You can leave a response, or trackback from your own site.